All American Check Cashing collects approximately $1 million in check-cashing fees each year. But according to federal regulators, the company, which also provides payday loans, obtains those fees through deceptive means, including refusing to tell customers what they will be charged and lying to prevent consumers from backing out of transactions. This is according to a lawsuit filed by the Consumer Financial Protection Bureau against All American, its owner, and its affiliate Thrifty Check Advance, accusing the defendants of a litany of illegal and deceptive business practices. Mississippi-based All American Check Cashing offers check-cashing services and payday loans at approximately 50 stores in Mississippi, Alabama, and Louisiana. According to the CFPB complaint [PDF], since at least 1999 AACC has charged a fixed fee for its check cashing services that vary by state and by whether a check is government issued. In Mississippi and Alabama, AACC charges a 3% fee for government-issued checks and a 5% fee for other checks. In Louisiana the fee is 2% for government-issued checks and 5% for other checks. While charging fees is typical of check-cashing companies, the CFPB alleges that AACC refuses to tell consumers how much they will be charged before handing over funds. “All American instructs its employees to hide the check-cashing fees by counting out the money over the fee disclosure on the receipt and removing the receipt and check as quickly as possible,” the complaint states. In fact, the company’s policies explicitly forbid employees from disclosing the check-cashing fee to consumers, even when directly asked. A training presentation for new employees instructs them to “NEVER TELL THE CUSTOMER THE FEE,” the CFPB alleges. In cases when customers decide they would like to take their business elsewhere or simply not have their checks cashed, the CFPB alleges that AACC instructs employees to lie and say that the transaction cannot be canceled. For example, employees sometimes apply a stamp to the back of the check—such as “For Deposit Only: All American Check Cashing Inc”— effectively locking the consumer into the transaction, the CFPB states. AACC’s unfair practices weren’t solely relegated to its check-cashing business, the CFPB claims the company also illegally deceived consumers about the benefits of its high-cost payday loans. According to the complaint, since 2011 AACC has used a multiple loan program for consumers who receive their benefits or paycheck once a month. 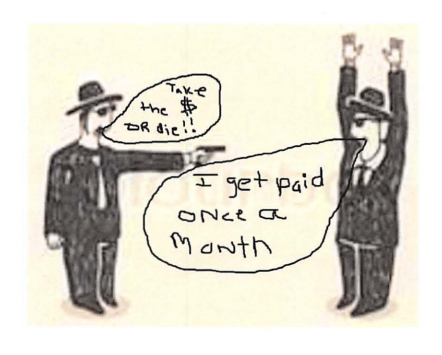 A cartoon allegedly passed between employees and managers at AACC. In order to attract customers to this program, the company allegedly made deceptive statements about the fees associated with the monthly lending model, while internally describing it as a “huge income booster” due to the extra fees consumers ended up paying. AACC allegedly instructed employees to tell customers that competitors’ 30-day loans were not as helpful and were more expensive than its own product. However, this wasn’t true. The CFPB provides an example of how the 30-day loan and its own three loan program. For example, in Mississippi, the CFPB says consumers getting a 30-day $400 loan will pay a maximum of $87.80 in fees. But with AACC’s program, the company could charge that same consumer $120 in fees by giving them a series of smaller loans. As part of the model, AACC would issue three loans to borrowers: one at the beginning of the month, followed by a second loan to pay off the first, and finally a third loan to extend borrower into the next month. While Mississippi law prohibits rollovers of payday loans, the CFPB claims AACC has regularly rolled over consumers’ loans as part of its multiple loan program in that state. In addition to deceiving borrowers about fees, the CFPB claims that AACC failed to return any overpayments to customers. According to the Bureau’s complaint, from at least 2011 until at least 2014, AACC did not notify consumers who overpaid on a loan. If the consumer did not request a refund, AACC would delete the credit balance from their account. The CFPB’s complaint alleges that All American unfairly failed to provide refunds to hundreds of consumers. The CFPB seeks to end AACC’s illegal illegal business practices, obtain refunds for borrowers, and impose penalties against the company.